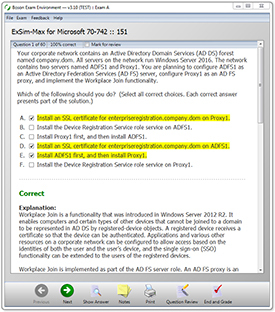 ExSim-Max for Microsoft 70-742 exam simulation software covers all of the concepts you need to know to pass the MCSA: Identity with Windows Server 2016 (70-742) exam. This 70-742 exam simulation software includes well-written, technically accurate questions and answers which are divided into three individual practice exams. These practice exams simulate the difficulty and variety of question types on the real exam so closely that, if you can pass our ExSim-Max for Microsoft 70-742 exam simulations, you will know that you are ready for the real exam - guaranteed. Download the BEE and try the practice exam demo to see how ExSim-Max can help you pass the 70-742 exam. The Identity with Windows Server 2016 (70-742) exam counts credit towards the MCSA certification. The Microsoft 70-742 certification exam focuses on the ability to manage identities using the functionalities in Windows Server 2016. Candidates for this exam, typically install, configure, manage, and maintain Active Directory Domain Services (AD DS) as well as implement Group Policy Objects (GPOs). Candidates should also be familiar implementing and managing Active Directory Certificate Services (AD CS), Active Directory Federations Services (AD FS), Active Directory Rights Management Services (AD RMS), and Web Application proxy. install and configure Active Directory Domain Services (AD DS). manage and maintain AD DS. implement Active Directory Certificate Services (AD CS). implement Identity Federation and Access Solutions.